note: Photo above may not represent manufacture. Photo does not show hex cuts. Used only for reference. The Nocturnal Sidewinder Series are fully adjustable, modular, and completely customizable to the end users specific needs. Why use a light mounted weapon? Because evil doesnt wait for daylight. Having a light bound Sidewinder allows you the ability to holster your pistol + light and cut through the dark. 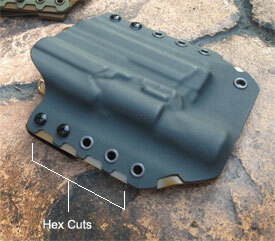 These custom formed holsters are precision crafted from Kydex varying from .06- .08 (standard) and .09 upon request. 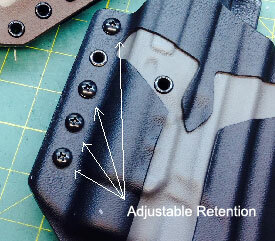 Sometimes you cant run a light mounted pistol (IDPA) so we invented a reliable method to make dual use of your holster. The light no light option allows you to run your holster without a light while not making the holster too tight by simply installing a cross bar that blocks off the light channel. If you dont see your make & model Or you wanted a completely custom build shoot us an email. If you are running higher sights, a threaded barrel, or extended slide release/stops please disclose as this will affect your fitment. All products are hand crafted and may vary slightly from batch to batch. 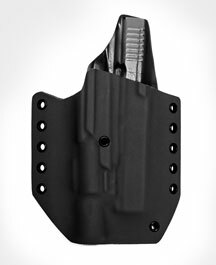 The adjustable fit offers a fine tuned holster with the retention YOU want.